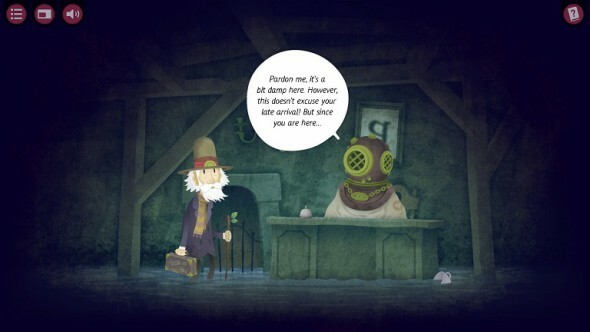 A videogame based on Franz Kafka’s literature, that’s what The Franz Kafka Videogame promises you. Franz Kafka, writer of The Trial, The Castle, The Metamorphosis and so on: while the name will certainly ring a bell, his work might not be so familiar. For those who know a little bit about his work, there will certainly be some obvious references, but even if you don’t know a thing about the man or his work, this game still offers a fun, surrealistic story. The game takes you along in the life of a character named K. K. arrives in town, settling as a psychotherapist specializing in the treatment of phobias and depressions. Thus he tries to make enough money to be able to give his sweetheart Felice, who he left behind, a decent wedding. When a patient enters his practice, complaining about nightmares she keeps having, he decides to put her under hypnosis. Everything goes well, but after the lady leaves, K.’s dog brings him a mysterious letter. He is invited to work for Castlock Corp. in America, which promises to take care of all his financial difficulties. K. doesn’t trust it much, but it seems everything has been decided for him already. From here on out, he is on a journey that takes him to the weirdest places, and the most intriguing characters. He realizes that the only way out of this dream is to sort out the problems of his unconscious, so he can wake back up in the real world. 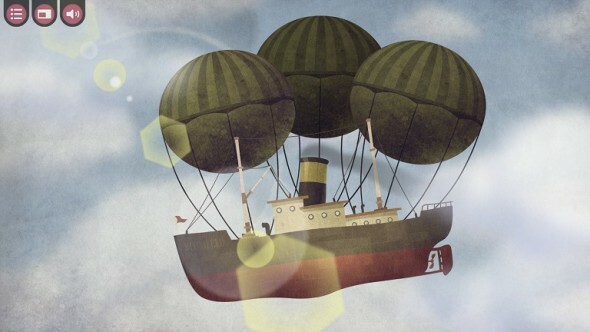 The story is both simple and absurd, which makes it very fun, and ideal to implement the many small puzzles you’ll have to solve to get Franz out of this fantasy world. It is told mostly using written text in the level intros, almost as if you were reading a book, while during the levels, the characters get speech bubbles to express themselves. This makes sure that a lot of information is given in a short period of time, yet with it all still feeling very relaxed and easy-going. Don’t expect to get to know too much about Kafka’s life or his literature though, as he is mostly just rendered into a cartoon character, to suit the purpose of the game. Graphically, the game looks quite like a comic book. The characters look very likable, and everything is displayed clearly, leaving out too much bulk in the backdrops. The overall look suits the game just fine, even though it is far from what one would call Kafkaesque. The more muted colors used for the graphics do make up for that a little bit, but the overall look certainly remains simple and sweet. Music is not very present in this game, even though there are some fun tunes to enjoy, tunes that have the sound of a long forlorn time. in return, the atmosphere is mostly set using circumstantial noises such as footsteps, or the rain falling to the ground. As mentioned before, no voice acting is used, but instead, speech bubbles make clear what the characters are saying. Just like the graphics, the sound remains fairly simple, but effective nonetheless. 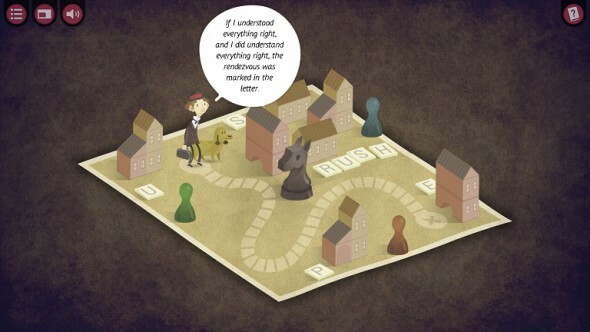 The Franz Kafka Videogame is a puzzle adventure game, roughly based on Franz Kafka’s literature. In order to get K. back to the real world, you’ll have to solve puzzles in his unconscious. These puzzles come in many different forms, using letters, figures, patterns and so on. You should be able to solve the puzzles using your common sense and some logical thinking, yet we often found it very hard to find the logic behind the puzzles. If you really don’t know where to look for the solution, you can get a hint. Every level has two hints at your disposal, yet there is a timer on each one of them. This means that you can’t use the hints straight away, but first are forced to look for a solution yourself, as you’ll have to wait for the timer to get to zero before you can actually see a hint. While the idea behind this isn’t bad, it did cause some frustration during our playthrough. Often, there aren’t many things to click on or figure out, thus when the logic isn’t there, this just results in you having to wait until you can use the hints. This makes the game a bit tiresome at times. All in all, the game is fun enough when you find the logic behind the puzzles, but when you don’t (which seemed to happen to us quite often), it easily gets frustrating. 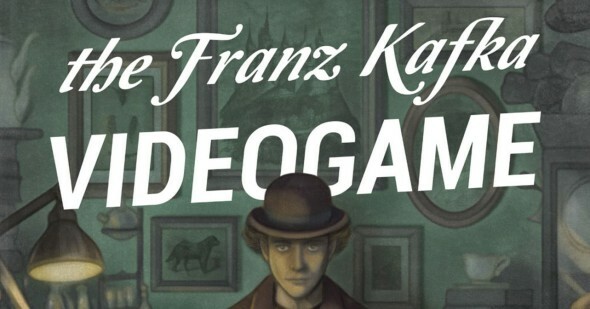 In roughly two hours, you’ll have played through the entire Franz Kafka Videogame. When it comes to replay value, there is hardly any, as once you’ve solved the puzzle, there is not much more to do, as there is not much use in solving the same riddles twice. In a game like this, it was to be expected that there is not much replay value, and we’re fine with that, but as this is the case, it would have been nice if our experience could have lasted a bit longer than the two hours we got. 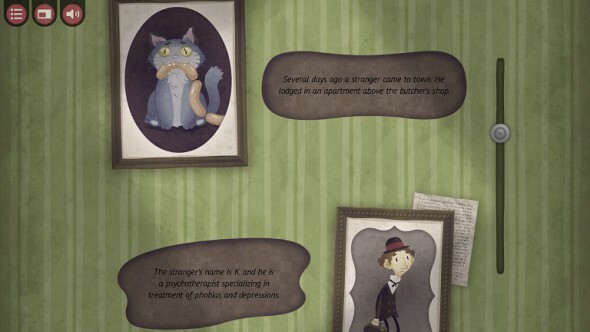 The Franz Kafka Videogame has its good points, such as the story and the graphics, that is if you’re willing to see through the fact that they are not really in a Kafkaesque style. The puzzles however, are often not very logical, causing some frustration, certainly as you have to wait before you can use the hints. All in all, we did like the game, but the frustration, combined with the fact that you’ll only be playing for about two hours before finishing the game, makes us wonder if the game is truly worth its price.